As with any youth sport, it’s up to the coaches to create positive environments for the players. What exactly does that mean? First off, make sure you learn the difference between good and bad stress. Some stress actually can be helpful in youth sports — to a point. Competition can be beneficial — to a point. When coaching a youth basketball team, moderation and achieving a balanced view of things will only help your team as a whole (and its individual players) succeed and even excel. Encouraging your players to do their best is one thing, but aggressively pushing them to excel and win is another. A little challenge and adversity is good for everyone. When kids feel jittery before a game, that’s an example of good stress. When kids feel pressured to win or succeed, it’s the bad stress, and they often end up under-performing in these cases. It’s important to establish a general philosophy and attitude at the start of the season to make sure your values are expressed to both the kids and their parents. After that, it’s all about being consistently supportive, offering kids the opportunity to succeed in practices, exposing them to game situations in practice, and giving everyone (not just the starters) a fair shot. Define your values: Are your values team unity? Keeping a positive attitude at all costs? Honesty? Integrity? Figure out which ones you’d like your players to keep in mind throughout the season — and beyond. To figure these out, write down your thoughts on some topics such as teaching, leadership, and success. Cultivate a leadership style: How do you want to lead? Gently? Firmly? Using motivation? Emphasizing strategy? Decide how you want to be viewed and treated by the team, and adjust accordingly. But make sure to be consistent — kids don’t respond well to inconsistency. Keep your main purpose in mind: Always remember what drove you to want to be a coach. Whether it was wanting to lead young people, teach them, help them, or all of the above, it will be your mainstay once things get tricky or there’s a bump in the road. Focusing solely on winning is why a large number of kids drop out of sports altogether. Changing the Game Project calls this focus “the enemy of excellence”. If all your team hears about is winning, they’ll take that attitude with them in life, and their inevitable failures will feel catastrophic. Instead of focusing on winning, keep the focus on personal best. Kids need boundaries and rules in order to feel comfortable. If they sense that an authority figure is either playing favorites or not enforcing rules, they’ll likely lose respect for your authority and then your team morale and performance will be negatively affected. Often, the coach’s emphasis is on strategy and creating a game-like atmosphere in practices. While this is an important part of coaching youth sports, without learning fundamental skills first, they won’t end up helping you build a successful team. Work on the basics: shooting, dribbling, passing, layups, footwork, foul shooting, rebound and defense. Once these are mastered, you’ll have a better chance of seeing your players succeed. Kids are constantly growing and changing, both physically and mentally. So it only stands to reason that your best players might not end up always being the best, and those who aren’t performing as steadily could very well develop the right skillset, just further down the line. Besides, when kids are consistently benched in youth sports, they lose heart and interest in continuing the sport. In the worst cases, they feel excluded and develop low self-esteem. Again, the emphasis on winning keeps the starters playing the games and the benched players sitting games out. Shift the emphasis, the results could surprise you. 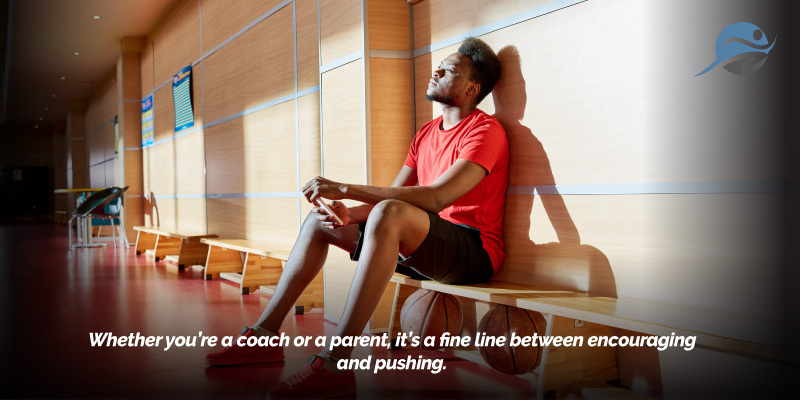 Whether you’re a coach or a parent, it’s a fine line between encouraging and pushing. The better you can learn to walk that line, the better chance you’ll have of helping to create happy and successful youth athletes. Pittsburgh-based Hustle Training is a growing startup created for the sports-driven players and coaches out there looking to up their game and maximize performance potential. Their website coupled with the mobile app makes it easy for players to improve their fundamentals and move on to master advanced techniques by providing crafted workouts and drills created by college coaches, professional players, and expert trainers.